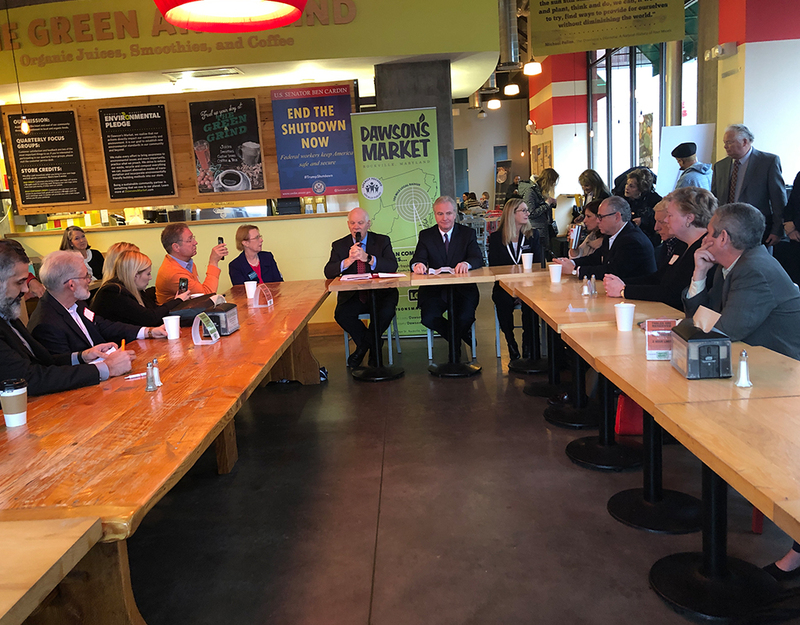 Senators Ben Cardin and Chris Van Hollen visited Dawson’s Market in Rockville Thursday morning to discuss the shutdown with local business leaders. Here’s what Montgomery County’s business leaders had to say about the event, followed by a Tweet recap of the roundtable discussion. MCM spoke with Elise Ambrose, the president of Elite Personnel in Bethesda, and Sherwin Shafie, the CEO of Marstudio in Rockville. According to Ambrose, many of Elite Personnel’s clients have canceled job orders because they are nervous about the economy. After the roundtable discussion, Ambrose, a Democrat, was satisfied with Cardin’s and Van Hollen’s efforts to re-open the government, but she was frustrated by Senate Majority Leader Mitch McConnell’s refusal to bring a bill to re-open the government to the Senate floor. During the roundtable discussion, Shafie, a life-long Democrat and an immigrant, challenged Cardin and Van Hollen about why Democrats are refusing to fund President Donald Trump’s proposed southern border wall. During Shafie’s interview with MCM, he said that there’s “a level of uncertainty” with his business clients (Marstudio is a branding and marketing firm that helped MyMCMedia with its website).